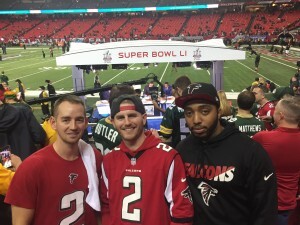 Game 46 – The Atlanta Falcons Make Warrior Wishes Come True At The NFC Championship Game! For the first time in almost a month, my dad is back in action making Warrior Wishes come true. 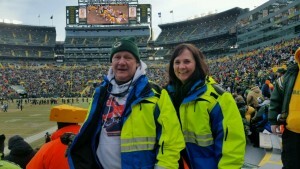 The last 2 weeks we have been honored to host warriors at both the Packers & Chiefs playoff games. However, due to inclement weather, my dad has not been able to travel to personally make the wishes come true. 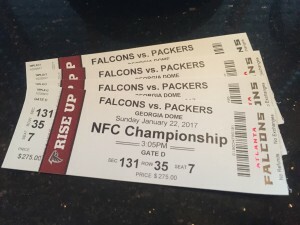 So for the first time in 3 weeks, my dad was “back on the bus” and headed to Atlanta to host a group of warriors at the NFC Championship game where the Packers & Falcons were facing off for a bid to Super Bowl LI! 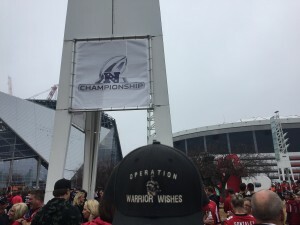 Thanks to our friend Steve Cannon, who had helped us honor heroes at the Super Bowl in New Orleans in 2013, we were able to make wishes come true at the NFC championship game. Steve is now in charge of getting the new state of the art Mercedes Benz stadium built in Atlanta, that will open next season. 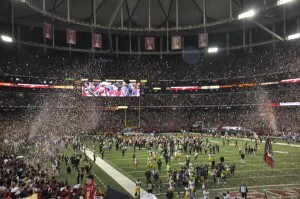 So today’s game, win or lose, will be the final game ever played in Georgia Dome! 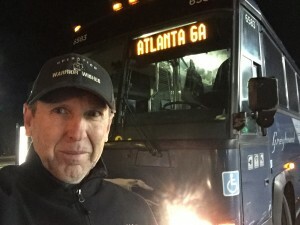 My dad arrived in Atlanta after a 16 hour bus ride at 9:15am. His plan was to meet the Warriors for lunch before the game, then walk them to the stadium before finding a place to watch the game outside the stadium. He had to catch a 10pm bus ride back to Chicago after the game, so there was little time to spare. My dad is not real fond of quick trips like this because it doesn’t provide enough time to hang out with the warriors, especially when my dad doesn’t go to the game. But when expensive Playoff tickets are donated, we make sure they go directly to our nations heroes, and not to us, so he made it work! My dad met up with the Warriors at Taco Mac located near the stadium. Daryl, the manager provided delicious pre game Meals for everyone again. 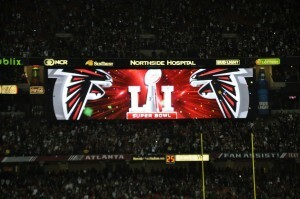 It’s the best place in Atlanta to meet before & after a Falcons game to fill up on great food & grab a drink. 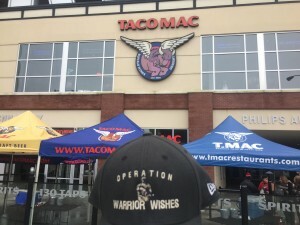 We cannot thank Taco Mac enough for helping us make warrior Wishes come true in Atlanta! 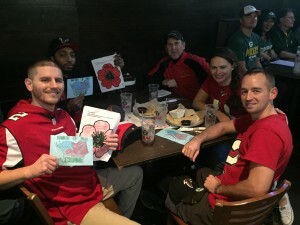 Everyone had a great time at lunch! 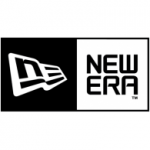 My dad presented the Warriors with their brand new Falcons caps thanks to our friends at New Era! After lunch, the gang headed over to the stadium to snap a few pics before heading inside to watch the Packers & Falcons battle to become the 2016 NFC champions! 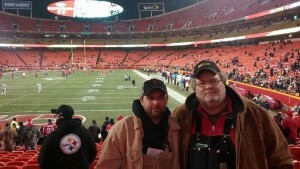 Once the Warriors were inside, My dad made his way back to Taco Mac to watch the game. 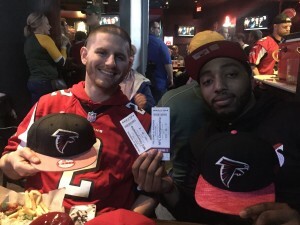 Jeff, Darius, Andrew and Tori were treated to awesome seats & were all very excited to see their Falcons clinch their first Super Bowl Berth in almost 20 years! The only thing standing in their way was a Red hot Aaron Rodgers & the Green Bay Packers! Everyone expected a high scoring shootout between 2 high flying offenses & they didn’t disappoint. 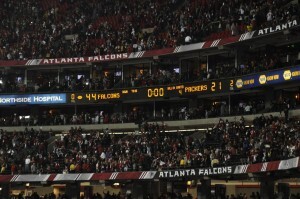 The only surprising thing is that the Falcons completely dominated the Packers & never let their foot off the gas. An early Packers fumble, as they were driving to the end zone, clearly changed the momentum of the game. The Packers quickly fell behind 17-0. The Warriors had plenty to cheer about all game long and relished in watching he confetti fall after the game as the Falcons won 44-21! They will be headed to Houston in 2 weeks to play in Super Bowl LI! Needless to say, this was a once in a lifetime experience for the Warriors & everyone had a great time! 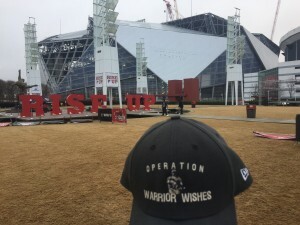 We couldn’t have made it possible without the help of Steve Cannon & the Atlanta Falcons who provided the opportunity to make these wishes come true! 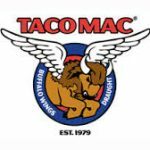 We also want to thank our friends at Taco Mac for providing lunch! After the game, the warriors got back on the road home, while my dad hopped back on another 16 hour overnight bus back to Chicago. He will be in Orlando next week to make wishes come true at the 2017 Probowl & the following week in Houston to make wishes come true all week long leading up to our season finale at Super Bowl LI! Stay tuned for more details! 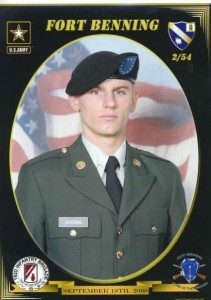 Jeffrey Shonk joined the United States Army July 8th of 2008. He was stationed at Fort Stewart, GA & deployed for the first time in July of 2010. 2 months and 10 days into his first deployment on September 23rd Jeffrey, PFC Gebrah Noonan, and SPC John Carrillo were shot in their room by their roommate. Jeffrey is the only survivor from that tragic night. 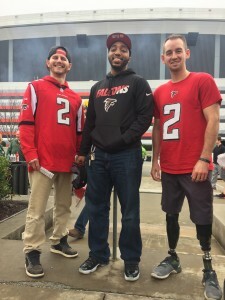 He spent the next 4 years in rehab learning how to walk and talk again after being shot in the head as well as working to get back to normal once he mastered walking and talking. Jeffrey is currently in culinary school following his second dream to become a top chef like one of his Idols Tom Keller. Jeffrey & his wife are proud parents to 4 children. 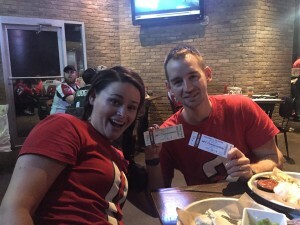 Game 45 – Warrior Wishes Come True At The Chiefs Playoff Game!